When developing in Python I enjoy using Sublime Text, especially its ability to run/build right from Sublime by simply pressing COMMAND+B. 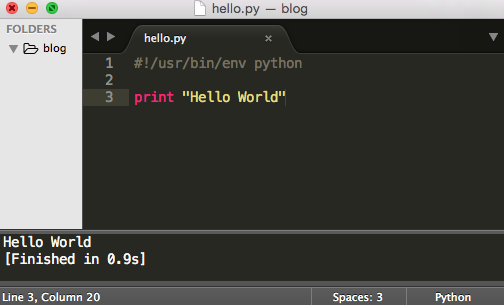 Meaning that I dont have to go out of the editor to the terminal to run the Python program. #!/usr/bin/env python print "Hello World"
But what if I want to run a Python Virtual Environment and its benefits (see developing-in-python-using-python-virtual-environments). Once the virtual environment is activated your terminal will use the Python Virtual Environment just fine, but Sublime Text will not, it will continue to use the system-wide Python environment by default. 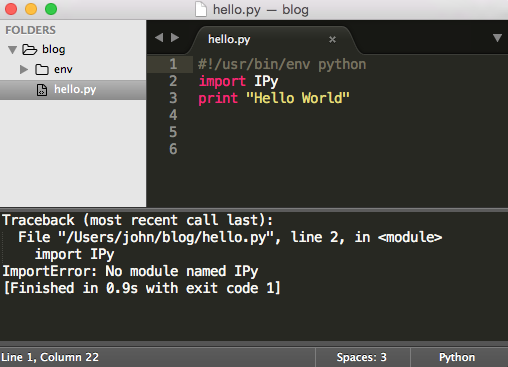 #!/usr/bin/env python import IPy print "Hello World"
To make Sublime Text use the virtual environment you need to create a Sublime project and edit its properties to use the Virtual Env. The shell_cmd: label is the command that will run when you build. It is far from perfect as you have to hardcode the Python program in the configuration, but at least works.